In this solo dining adventure, Gary has the burger at P.J. Clarke’s for the first time. 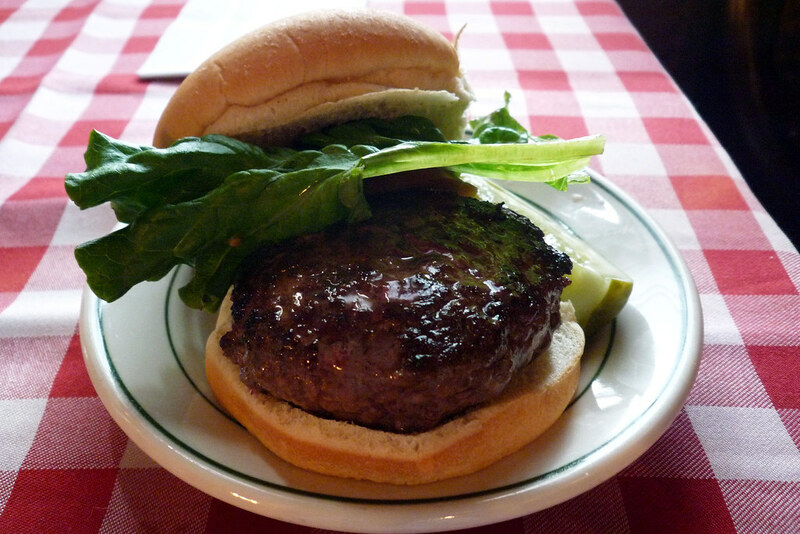 In New York City, there’s a pantheon of pub burgers where devotees sing its praises – we’re talking about places like the Corner Bistro in the West Village or Donovan’s in Woodside, Queens. Another such burger can be found at P.J. 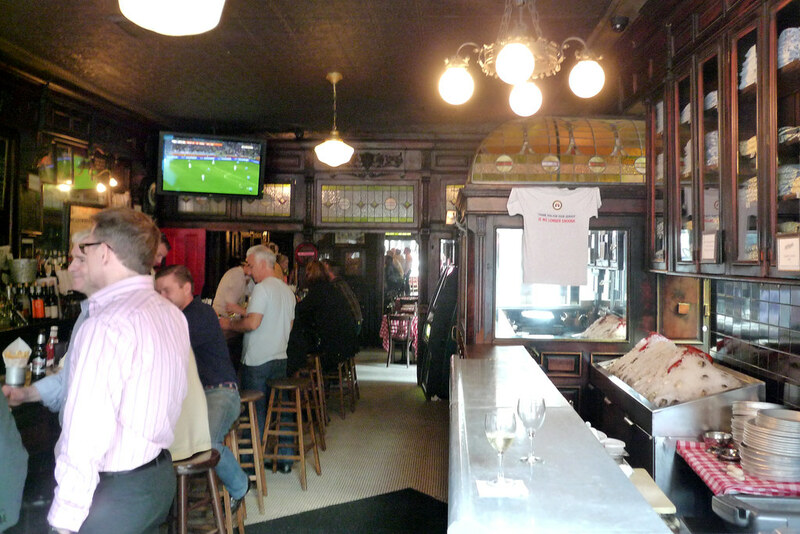 Clarke’s in Midtown East (and many other neighborhoods these days). Despite all my years living and eating here, I’ve never actually had the burger at P.J. Clarke’s. That probably has to do with the fact that it’s always been packed whenever I went (usually after work), making it a chore to down a pint never mind trying to have a meal there. That it’s busy on a weekday after 5pm is hardly any surprise considering it’s in office building central and just about every bar in the area suffers (profits, really) from a considerable happy hour crowd. No longer shackled to an office desk, I no longer have to wait until the early evening to attempt to try the P.J. Clarke’s burger. No, I can just walk in at 3pm and grab a seat without a wait. That’s just what I did a few Fridays ago – I didn’t get a seat at the bar (the first day of the World Cup so all the stools were taken there) but I was quickly seated in a three-quarters empty dining room. I ordered my burger medium-rare (always a safe bet to get the best out of one) and only a few minutes later, that’s exactly what was placed on the table in front of me. P.J. Clarke’s goes for a very spartan presentation for their burger – just the burger on a bun with a lettuce leaf and a tomato slice, plus a pickle spear on the side. Unlike most pub burgers, this isn’t a gargantuan one (think Donovan’s) and if I had to guess, it’s got maybe 50% more beef than a Shake Shack burger. It’s solidly packed, charred nicely though with a pretty greasy finish on the surface. Taste-wise, it’s got all the components of a good burger – fresh, beefy flavor, the texture of cooked ground beef, and well-salted. The bun here is a good one that’s slightly chewy but yields nicely when bitten into and adept at soaking the juices from the burger without turning into bread soup. 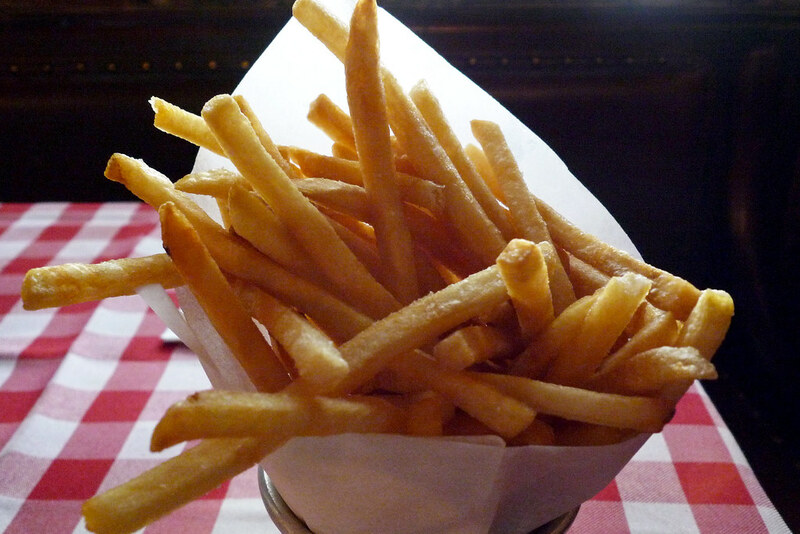 The fries here are solid – thin and crispy with plenty of salt. No ketchup necessary for these fries. Served smartly in a conical paper funnel to keep them warm. P.J. Clarke’s does indeed serve a good burger and some solid fries. But would I recommend eating there? I hate to be indecisive but it’s definitely a mixed bag of a verdict that I’ll be passing here. Between the burger, the fries, and one beer, my bill was already over $20. After tip, it’s gonna come close to $25 to have a meal here. If you’re willing to pay $25 for a burger, fries, and a beer, I’d recommend HB Burger for a Midtown burger. Yes, I’m aware that they’re not really all that close to each other but we’re talking about a better burger, better fries, and better beer selection at HB Burger for just about the same price. Of course, if you’re like me and are still a P.J. Clarke’s virgin, it’s worth a shot just to see why it’s got a vaunted reputation. It’s certainly well deserved – I just think for the best bang for my buck, this isn’t the place to get it. A note on service – whatever you do, eat at the bar. With the exception of the time it took for my order to come out, everything else entailed a long wait. This includes, but not limited to, waiting to order my food, waiting for my glass of water, and waiting for the check. Keep in mind this was a dining room that was three-quarters empty so maybe there were 12-16 people here and three servers for the lot of us. Meanwhile, there’s one guy behind the bar who’s doing a much better job making sure everyone’s being kept happy. Of course, that might just be the alcohol doing its job. P.J. Clarke’s. 915 3rd Avenue, New York, NY‎ 10022. [Show/Hide Map] (212) 317-2043.